I just sent this message to most of my face books friends; Happy Blessed Bright Rainy Day. May your mind be bathed in wholesomeness by precious dazzling rain. Have awesome togetherness and toothsome health food with your dear beloved family in heart and doting friends around. Take Care I would love to share how we did it. 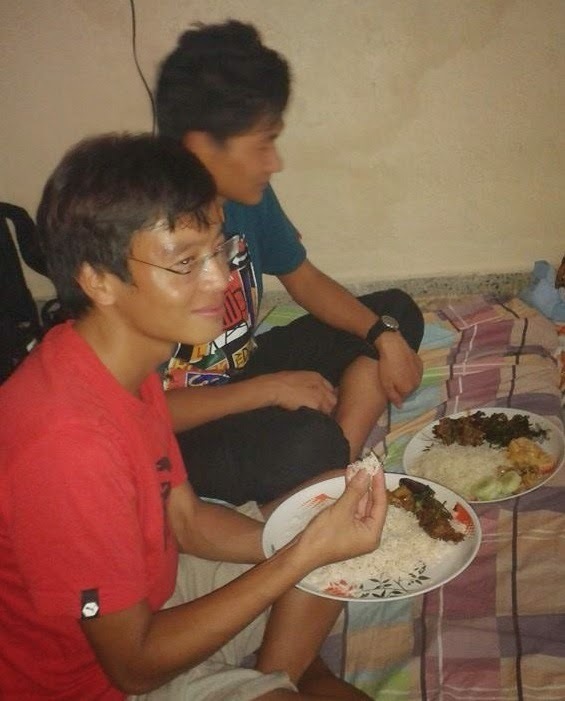 Since we had classes, we decided to get together for the dinner at Ugyen's home. There were eleven of us Pema Tenzin, Thinley Penjor, Ugyen Namdol, Yonten Jamtsho, Nityam Nepal, Sonam Tshomo, Kinzang Lhendup, Karma Namgay, Wangchuk, Namgay, Rinchen Namgay and myself. Thinley, Kinzang, Sonam and Wangchuk had done shopping. At around five thirty we moved and by six we gathered. Ugyen had already made ready with suja and deay-si. We had it deliciously. 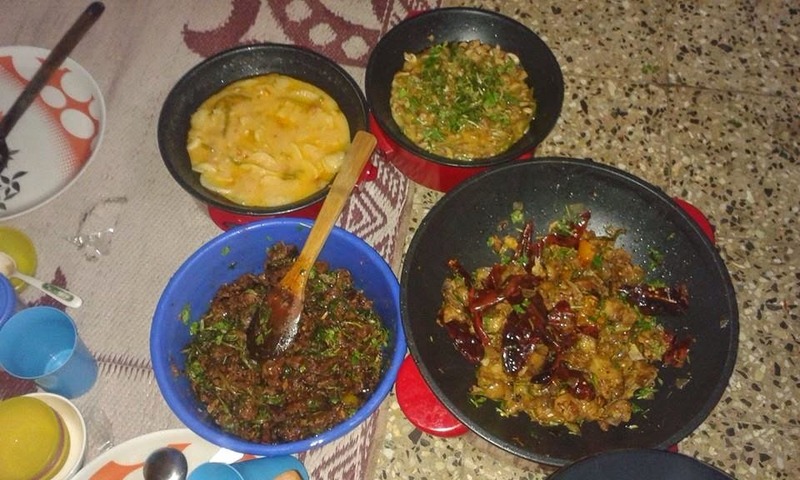 Within, no time Pema and I started to prepare curry, he got ready for the meat (pork and beef) then I got ready with mushroom while others busied with watching movies and PlayStation because we told them, as too many cooks spoil the broth. I love cooking as said by Al Roker; "I love cooking for myself and cooking for my family," and I continue, cooking for my dear doting friends. I wish I was a great cook for I yearn for it. I know I can be it. I am in the process of learning. One day I will be and I am so curious about it. Pema boiled the meat while I had good time chopping vegetables both for my mushroom and his meat. Since, mushroom was only the curry for vegetarian we decided to prepare kaywa-datse (amalgam of potato and cheese). Ugyen was in charge of this. He energetically prepared with the ingredients. Then with less time I started to make mushroom curry paste. I did it carefully, for I should and confidently, for I have little experience about its preparation. In between, I helped Pema with his meaty curries. He is a great cook, I had learned a lot from him during past one year of our togetherness through Todd English's citation; "I liked the energy of cooking, the action, the camaraderie. I often compare the kitchen to sports and compare the chef to a coach. There are a lot of similarities to it." I am grateful to him and I shall continue to learn from other of my friends for my passion. Ugyen too is a great cook, I can say it certainly from the way he prepared toothsome deay-si. At around, eight, three of us got ready with our curry preparation, just left with boiling of rice, after all it was the easiest job unlike curry. Within no time, with little conversation among us, we did it. Then, our chief guest ( some of us said 'cheap guest') Thinley with Kinzang went to get some drinks from the bar for obviously, traditionally, drinks add beauty and joyfulness for such celebration without which we would not feel the specialty of the day. After getting ready with the dishes, once again we sank in circle for the drinks for evidently, sitting in circle and chatting, has been the way we were grown up. It's our traditional way of having conversation that always serves the purpose. We had great time with juices and drinks with snacks. Especially, I including some of my juniors had fun time listening to the stories narrated by our chief guest Thinley and I was sure that some of the stories were really being cooked up by him, I could smell it. But, we were happy that they didn't fail to bring smiles and laughter at our face. Thanks cheap guest, I mean chief guest for this. Since my stomach was growling, I was sure others too, I asked them if we could have dinner, surely they replied in unison. Finally, we had two bowls of moreish boiled rice and four various appetizing curries and sliced cucumber. We made some arrangement with dishes and started self-serving starting from our chief guest. One by one, back to back, consecutively, we took our share. Finally, my turn, I took my share with my own hand made mushroom with kaywa-datse for I am a vegetarian. Silently, we had. It is always the best to eat in silence or else we might not be able to taste the very gist of meal. Besides, it is considered as an indiscipline if we talk and eat. But our chief guest, would not mind chatting while eating, he cracked jokes and we had good time with our belly laugh. As said by Charles R. Swindoll; "I cannot even imagine where would be today were it not for that handful of friends who have given me a heart full of joy. Let's face it, friends make life a lot more fun," we must always be thankful to our friends for making our life a worth living and for their constant help in all the callings. They are just like a smile and silence those solve many problems and avoid many problems, respectively. Friends brighten us. Friends lighten us. They are only the one who raise our head and encourage us to look forward with much enthusiasm and optimism, beside our parents. Cherish you friendships, they are priceless. After dinner, we put the left over dishes in the kitchen and took a long rest while Nityam and Sonam took in charge for washing plates. I felt sorry for I could not help them. Once again we got together for the left over drinks. Rinchen left home due to his uneasiness. Seven of us gathered in closeness while Ugyen and Wangchuk were busy with PlayStation. Then, Thinley began to narrate stories both real and cooked up, followed by Pema, while we silently listened to them. Some times, dissolving into laughter due to jokes. We began to chat about many things, both common-sense and non-sense. In this way, we get to know more about each other, feel comfortable and become friendly which are the very lifeblood of friendship. By around twelve, I began to feel drowsy and dozy. I must sleep in time, it's my rule or else I will have severe headache and uneasiness. Remember, sleep is most, maximum 8 hours because there is an awesome psychological reason for sleep and you got to know its benefit. Over ad above, to know its power is must and is a need for every individual. I asked our chief guest if we can leave for our home. Then only by twelve thirty, we were able to happily wave bye-bye to go to bye-byes with the words of thankfulness and fruitfulness. It's our traditional way of thanking each other at the end of every thing for it sounds great. Before a step at door frame, I felt it will be the best to make everyone of them laugh, so I made up with my mind, I intentionally asked our chief guest to giveaway seulra ('prize as reward' as usually the chief guests do) to the host and within a split of second every body guffawed, finally proving chief guest to be a real cheap guest. When we reached at gate the chief guest was murmuring to me, why I had to do that. I am a jokester, I love joking, it's one of my hobbies because I feel happy when I see others smiling. Coming out, the sky was azure, the high way was filled with vehicles even at this time. I wondered when do they sleep and their idea about the power of sleep. Time hasn't changed but people have changed, God created day for us to work and night for sleep but we are busying ourselves or should I say pretending ourselves to this fact. But, remember, this is just like a boomerang, the effects will be reflected to us only and then we will know during that time. On the way, I saw street people dossing for their night, I am sure, wondering about their life because I do frequently wonder about them. Whenever I see them, I have these two eternal feelings in me; I feel ashamed for remaining helpless at the very moment and I feel pity on them followed by my praising prayers for their happiness for all the times to come. I have been yearning for benevolence and I will also do it for one day I shall do it for I always buy Albert Einstein's wisdom; "I believe in one thing - that only a life lived for others is a life worth living." May almighty god bless them. I know god will surely bless them. What a day spent fully with your friends! I could imagine the situation by the flow you narrated here. I went to Bhutanese students' place for dinner during Losar in Kolkata before and I believe it was almost the same situation. Rima ma'am, I would love to cook for you lol :) but you must not expect perfect from me. Yeah, we had great time. Thank you for your hearty visit. Hope everything is going well everyday. Take Care.